the Hancock UCC U2charist - televised! As y'all know, on Tuesday evening I played lead guitar and did the vocals alongside drummer Elisa Lucozzi and bassist Roseanne Hebert at Hancock UCC in Lexington for a U2charist with entirely live music. I didn't know until shortly before the start of the prelude, though, that the service was to be televised (on local cable) and recorded to DVD. *Gulp! * And on my first public outing as a lead guitarist too -- which I was trying to do while also doing lead vocals! There were some additional challenges as well. Various technical issues meant that I didn't have a vocal monitor as such; we were using our monitors as a P.A. system to project the vocals and drums into the congregation. Even my guitar amps were angled primarily for the congregation to hear; the direct sound out from the amp hit me at about knee level. Guitar cut out during "Sunday Bloody Sunday." My microphone cut out during "Walk On." I missed a chord or two, I'm pretty sure. In other words, it was rock and roll! I reminded the perfectionist part of me that U2 themselves often have things go awry, and sometimes (e.g., Bono's unplanned and very lengthy plunge into the audience during "Bad" at the original Live Aid concert at Wembley) the Spirit's worked powerfully through it. I'm still not entirely sure I'm going to watch the DVD. I'd rather judge the evening by what I saw of the congregation's experience of it than by a recording. And by what I saw in the congregation, it was a very, very good night. A packed house pledged their voices to the ONE campaign and gave generously to Oxfam for relief of extreme poverty, and by the end of the evening, I don't think there was a single person in the congregation who wasn't on their feet and singing their heart out. I'll be posting more about the experience and what I learned from it (yes, I've been doing U2charists for almost five years now, and I'm still learning!) 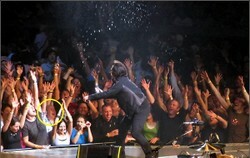 at the U2charist resources page. I'll be singing and playing guitar alongside Elisa Lucozzi, drummer extraodinaire, at a U2charist at Hancock (Massachusetts) UCC on the evening of March 4th. If you're in the area and would like to experience a U2charist with live music -- or to see how you can do a U2charist with entirely live music when you've only got two musicians -- please save the date! We're planning a session in the early evening at which anyone who wants to come to the service but isn't familiar with U2's music can learn songs we'll be singing, then have a break for my voice and Elisa's hands to recover, and then the service will start. I'll announce the exact times soon. Blessings, and I hope to see some SarahLaughed.net readers there! For more info on the U2charist, check out the U2charist resources page. Lately there has some discussion in the partisan blogosphere as to whether one should give to Episcopal Relief and Development if one disagrees with one or more things going on the The Episcopal Church, or to Anglican Relief and Development if one doesn't, or if it's better to give to some other organization entirely. If you want to give to change the world, to relieve global poverty, than the theological bent of particular people involved in the organization doesn't matter much. What matters much, in my reading of the life and teaching and death and resurrection of Jesus, God's Christ, is our giving is that we're engaging God's mission by doing so, and that means giving as much as possible from compassion for the poorest and most marginalized and as little as possible from our sense of what will accomplish any partisan church or civic political aims. So yes, I support Episcopalian Relief and Development, and rejoice when others do. They do amazing work, partnering with indigenous ministries for maximum efficiency and sensitivity to local context, and spending as little as possible on overhead versus aid. I've looked into them, and I feel on solid ground in saying that their work is worth supporting, whether you're an Episcopalian or not, and whether you're a fan of any particular policy or other tendency of The Episcopal Church or not. Episcopal Relief and Development, as far as I can tell (and I would welcome any data I should take into account that might demonstrate the contrary), is doing important and urgent work that's Good News to the poor. I have not investigated to the same degree organizations such as Anglican Relief and Development (which, as I understand the situation, was formed by groups seeking to break away from The Episcopal Church to provide aid especially from organizations and people who, for a variety of reasons, can't accept funding for or don't feel comfortable donating to anything associated with The Episcopal Church) and Five Talents. I hear good things about what they're doing, though. What I encourage everyone to do is to INVESTIGATE. Ask questions about how much money goes to fund people in the U.S. (you'd be surprised at how many organizations claim to be about ending extreme poverty involved and that still spend most of their income right here, one white people better off than me). Ask them about their partnerships with organizations indigenous to the populations they serve. Personally, I don't chalk up anything I give to organizations that spend more than 15% of their total budget as PROGRAM budget OVERSEAS part of the 1% that organizations such as the ONE Campaign is advocating. In other words, how much is my giving helping comfortable American citizens live comfortably while they talk about extreme poverty? Talking about extreme poverty is important, but does not necessarily relieve extreme poverty, and personally I prefer to fun initiatives -- such as Global Voices -- that give voice to people outside the U.S. and who work directly with if not being immediately among the populations most affected by extreme poverty. And with respect to organizations abroad, how much budget goes to administration as opposed to program -- i.e., the program of relieving extreme poverty, as opposed to talking about relieving extreme poverty? What accountability measures are in place to assure that checks cashed are used by the organization for its stated mission? Personally, I don't many organizations -- faith-based or no -- that match Episcopal Relief and Development (ERD) in terms of efficiency, cultural sensitivity, and working to channel relief in directions that foster autonomy. I suggest, a la St. Paul's advice in his letter to the churches in Rome, that you strive to outdo ERD in collections gathered, in accountability offered, and in effectiveness in getting relief and means to economic sustainability to those in extreme poverty. Do that and I'll stand up and cheer at the top of my lungs. Because in the end -- I have to say as some who takes seriously Matthew's report of Jesus' talking about 'sheep' and 'goats' -- I don't give a rodent's posterior about which organization sends which people which tax form. I just want a world in which every child has a chance -- clean water, enough food to get by in reasonable health, enough health care to end childhood mortality from diseases we have for decades had cheap technologies to cure, enough education and a clean enough environment to make a living by their own hands. We could do it -- not just because we have the resources (and we do -- because God has blessed this world with more than enough resources), but because, I think, there's critical mass in this world such that if those of us who believed this but aren't making a big deal about it decided to make a big deal about it, we could witness firsthand the changing of the tide that God is doing. I'll write more about this soon, I'm sure -- especially given that this is Lent, and that I've got certain ideas (for which I'm deeply indebted to the prophet Isaiah, among others) about in what kinds of fasts God is engaged and honors -- but I wanted to go on the record about this much right now. Today is the last day of a truly lovely vacation. I'm writing on the screened-in porch of our cabin overlooking a New Hampshire "great pond" (think small lake), listening to the wind whispering through the trees and reflecting on just how much good it's done my soul to spend a week getting lots of sun, fresh air, and time on the water, preparing and enjoying simple and delicious meals, watching clouds drift across the sky, and thinking. I did some reading on development to reduce or eliminate extreme poverty. Since the U2charist has taken on such a remarkable life of its own around the world, I've felt the need to be better informed about issues related to extreme poverty. I have often preached and written about the spiritually dangerous position we place ourselves in when our response to poverty is to lob money at or in the direction of poor people such that we feel generous, but retain a death-grip on the power and privilege that keeps us in the position of deciding, in effect, through our charity who lives and who dies. I worry that sometimes when I'm talking with people planning U2charists, where the money should go and why seems like an afterthought. I think about how many times I've heard an American Christian say something along the lines of, "well, it really doesn't matter WHAT you do to help; what matters is that you try to do SOMETHING, and that your heart's in the right place." It matters a great deal, I dare say, to those who do live in extreme poverty whether what you do is effective and for whom, and I want my work to support organizations and approaches that make the most difference for those in greatest need. I think in the months to come I'll do some more blogging about what I've been reading and what thinking it's prompted, though I'm still deciding whether Grace Notes or the U2charist page would be a better venue for it. But I haven't been spending all of my time or even most of it this week reading and thinking about development. This has been a real, honest-to-gosh VACATION, and the first one I can recall of this length in I don't know how long. I've used many vacation days over the years for speaking or conference engagements, and have sometimes been able to surround the work with a few days in a nice spot nearby to make a sort of working vacation. I've visited family or friends, usually for a long weekend and also often in conjunction with some kind of work. It's a different experience altogether to go somewhere beautiful and quiet -- no cell phone reception to speak of, no Internet access, and no intrusions of concerns from elsewhere. To post my lectionary blog, I drove around until I found an open wireless network -- and New Hampshire must be the top state in the Union for Internet security, as it seems just about everyone keeps their network locked down tight. I finally found a tiny public library -- the Frost Free Public Library, a name which must strike many as ironic in New Hampshire winters -- that was closed, but that kept its wireless up and open. But at the cabin, there's no 'Net at all, so not even Anglican politics could intrude. Lovely. I'm finding that the Impact self-defense classes I've taken have inspired me to renegotiate my relationship with my body, which I'd been seriously neglecting for quite some time. For my honey's birthday, I arranged for us to take kayaking lessons, and we now have a "season pass" on kayak rentals that lets us try out all kinds of kayaks whenever we want for the rest of 2007. This week, I've been paddling a Wilderness Systems Tempest Pro 170, and I love it. It's a versatile kayak, suitable for ocean use, long enough to track decently, and maneuverable enough to still be fun in quieter water. It's longer and narrower than the kayak I used in our class, which makes it easier to tip and a little more difficult to get into and out of (especially for a gal with dislocating kneecaps), but it's also significantly more responsive, which is fun -- and very useful when the wind kicks up. It's got a composite hull that's lighter and seems to allow for more speed than plastic ones as well, and I've very much enjoyed paddling fast enough to get a nice breeze in my face and to work up a sweat. I'm almost tempted to say that this is the kayak for me, but I do plan to try others, and it's nice in the meantime to have a physical, outdoor activity that I actually love (other than surfing, a sport for which the Charles River and Boston Harbor are far from renowned). I think it'll be good for body and soul for the rest of the season to walk once or twice a week to the boathouse and paddle for a couple of hours. A number of folks have expressed interest in a copy of my sermon for the U2charist held this past Saturday sponsored by the Episcopal Diocese of Michigan, Journey of Faith Church, and Christ Church in Dearborn, Michigan. I'll probably blog on it later this week -- it was a wonderful, amazing experience, thanks to the hard work of those who prepared it and the good hearts of those who participated -- but I've already posted my sermon from the service here. I've finished the sermon for the U2charist this Saturday in Dearborn. I'm excited about this weekend -- good people, rockin' liturgy, good times! For those of you in the area, here's the press release with details of the U2charist in Michigan this coming Saturday. It'd be great to see you there! Theologian Sarah Dylan Breuer of Cambridge, Mass. will preach. DEARBORN, Mich. (May 21, 2007) – The walls of Christ Episcopal Church in Dearborn are expected to reverberate with the music of the Irish band U2 during a special worship service, known as U2Charist, beginning at 4:30 p.m. on Saturday, June 16, 2007. The church is located at 120 N. Military in Dearborn. Hosting the service is Journey of Faith Church, formerly known as St. David’s in Garden City. Partnering with Journey of Faith will be the Episcopal diocesan office of Youth and Young Adult Ministries along with Christ Church of Dearborn and St. John’s of Plymouth. Delivering the message for the U2Charist will be Sarah Dylan Breuer of Cambridge, Mass., who developed the idea of the U2Charist service in 2004. Since then the U2Charists have grown beyond their origin in the Episcopal Church to become a worldwide phenomenon. The U2Charist service focuses on the United Nations Millennium Development Goals (MDG), which have been endorsed by every nation in the world and many religious denominations, including the Episcopal Church, to eradicate extreme poverty and global AIDS. “Our service will follow the pattern of Journey of Faith’s weekly worship service and incorporate multimedia featuring music from U2 including such favorites as “Where the Streets Have No Name,” “Yahweh,” and “One,” added Pastor Jenkins. The band U2 has given permission to use their music in such services as long as emphasis on the MDG is maintained. Bono, the lead singer of U2, has been very outspoken on issues for social justice and has initiated several programs including the ONE Declaration, www.one.org, an effort to rally people in the fight against poverty and AIDS. The public is welcome to attend the U2Charist. More information is available by calling the church office at 313-565-5512 or visiting www.JoFChurch.org. Journey of Faith Church is a small, open group that is highly informal in its dress and worship, which includes a blend of contemporary and ancient forms and prayers. Worship services are led by the Reverend Mark Jenkins and conducted in much the way early Christians worshipped with readings, reflections, prayer and table fellowship. Journey of Faith Church describes itself as being a “journey of faith,” offering a new approach to traditional religion by encouraging each person to experience the spiritual journey in a way that is authentic and honest. 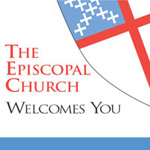 Regular services are held every Saturday afternoon at Christ Episcopal Church at 121 N. Military in Dearborn.